WASHINGTON — As Democrats grapple with divisions over the best way to address rising anti-Semitism in the U.S., congressional Republicans have been pushing for a more aggressive approach — and angling for political dividends. 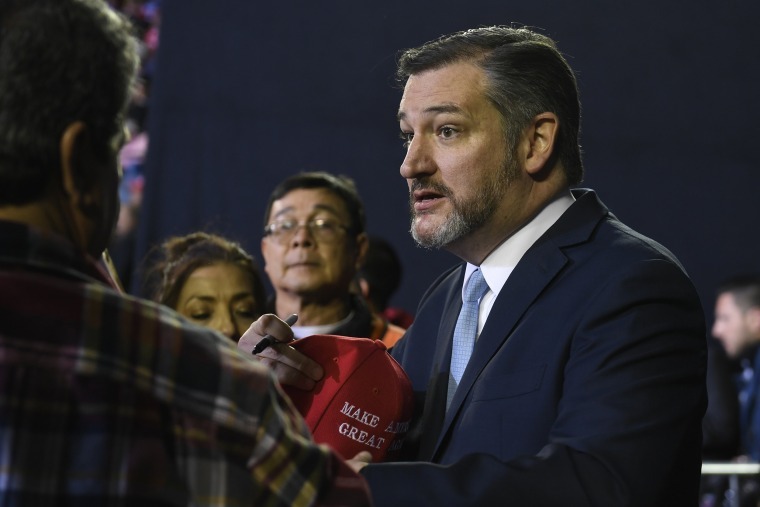 A fresh effort came from Sen. Ted Cruz, R-Texas, who planned to introduce a measure Tuesday afternoon that would directly condemn “all forms of anti-Semitism,” a GOP aide told NBC News Monday, following the recent remarks by Rep. Ilhan Omar, D-Minn., about Jewish lawmakers. Critics have accused Omar of deploying the “dual loyalty” charge Jews have grappled with for centuries. GOP leaders are planning to hold a floor vote on Cruz’s proposal, according to The New York Times. An aide to Senate Majority Leader Mitch McConnell, R-Ky., declined to confirm the plan. The latest Republican push comes shortly after a tumultuous week this month in which House Democrats were divided over how to respond to Omar’s comments, the latest in a series of remarks from the freshman lawmaker to spark controversy. Initially, Speaker Nancy Pelosi, D-Calif., aimed for a simple resolution condemning anti-Semitism without addressing Omar directly. But that strategy ignited pushback from some progressive members of the Democratic caucus, who pressed leadership for a measure that encompassed hatred against a number of minority groups. The House ultimately passed the resolution in a 407-23 vote. At the time, Republicans criticized Democrats for the approach, arguing that a resolution lumping anti-Semitism in with other forms of hatred would deliver a weaker message. Cruz's measure is the most recent in a string of proposals from GOP lawmakers in the House and Senate this session geared to fighting anti-Semitism. Rep. Gregory Steube, R-Fla., introduced a measure this month that would directly disapprove of “the anti-Semitic comments made by Representative Omar.” In January, Rep. Lee Zeldin, R-N.Y., who is Jewish, introduced a resolution with a group of other Republicans that would “reject anti-Israel and anti-Semitic hatred in the United States and the world” that specifically mentioned Omar. Rep. Ron Wright, R-Texas, unveiled a resolution earlier this year that, in addition to condemning anti-Semitism, called on federal law enforcement to investigate all credible reports of hate crimes, incidents and threats against the Jewish community. Meanwhile, the White House has used Omar's comments as a cudgel to attack House Democrats, with Vice President Mike Pence slamming Democrats over the remarks in a speech at the American Israel Political Action Committee's annual policy meeting on Monday. “Anti-Semitism has no place in the Congress of the United States, and any member who slanders those who support the historic alliance between the United States and Israel with such rhetoric should not have a seat on the House Foreign Affairs Committee,” Pence said, alluding to Omar, who sits on the panel. “The party that has been the home of so many American Jews for so long today can no longer muster the votes to unequivocally condemn anti-Semitism,” he added. President Donald Trump, who has repeatedly blasted Democrats for their reaction to Omar’s remarks and suggested that Jewish voters would soon flock to Republican candidates, recently tweeted a comment from a Fox News guest warning of political consequences for the opposing party over the issue. “'Jewish people are leaving the Democratic Party. We saw a lot of anti Israel policies start under the Obama Administration, and it got worsts & worse. There is anti-Semitism in the Democratic Party. They don’t care about Israel or the Jewish people.' Elizabeth Pipko, Jexodus,” Trump tweeted. According to the American Jewish Population Project at Brandeis University, 54 percent of American Jews identify as Democrats and 14 percent identify as Republicans. Thirty-two percent said that they don’t identify with either party. A 2018 survey conducted by the Jewish advocacy organization AJC found that 51 percent of American Jews consider themselves Democrats and 16 percent consider themselves Republicans.